FT-Single Hole Solderless | Cal Fasteners, Inc. 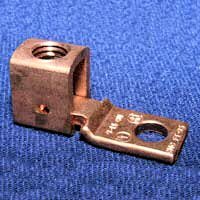 The 'FT' copper connectors have standard catalog items: FT-65, FT-70, FT-90 and FT-105. It is part of a 3 piece assemble including the Collar, Tang and Set Screw. They are for use in copper conductors only. The "Collar" of the 'FT' connector type is square and the "tang" which is tightened down on the wire with the Hex drive set screw for a secure tight fit. If you are looking for this type and need something close but a little different than the sizes listed, it may already be available. Contact Cal Fasteners to find out more information on the FT Type or contact us to Request a quote.